We’d love your help. Let us know what’s wrong with this preview of Neal Cassady by David Sandison. To ask other readers questions about Neal Cassady, please sign up. Cassady was a guy I was aware of who he was but I had no idea of what it is he actually did in life other than the main character in Kerouacs On the Road was supposed to have been based on him and that he hung out with all the famous beat writers, Ken Kesey and the Grateful Dead. I'm still not exactly sure what it is he did other than use his life as an example to the people mentioned. He certainly didn't write anything of note. The biggest surprise to me was he was a fanatical follower of Edgar Cassady was a guy I was aware of who he was but I had no idea of what it is he actually did in life other than the main character in Kerouacs On the Road was supposed to have been based on him and that he hung out with all the famous beat writers, Ken Kesey and the Grateful Dead. I'm still not exactly sure what it is he did other than use his life as an example to the people mentioned. He certainly didn't write anything of note. The biggest surprise to me was he was a fanatical follower of Edgar Cayce. Neal Cassady… what a trip. There are several bios on Neal out there including “The Holy Goof” by William Plummer that may be more definitive but this treatment does a great job of telling the story of Neal and his wild ways. If you want to know about the Beat Generation and how Cassady came together with Allen Ginsburg, Jack Kerouac, William Burroughs et al and how they related to the hippie movement this is a good resource. This biography was begun by David Sandison who was clearly smitten with Neal Cassady… what a trip. There are several bios on Neal out there including “The Holy Goof” by William Plummer that may be more definitive but this treatment does a great job of telling the story of Neal and his wild ways. If you want to know about the Beat Generation and how Cassady came together with Allen Ginsburg, Jack Kerouac, William Burroughs et al and how they related to the hippie movement this is a good resource. This biography was begun by David Sandison who was clearly smitten with the legendary Cassady but unfortunately didn’t live to see the book to completion. His notes were picked up by his friend, writer Graham Vickers following Sandison’s death, a true labor of love for a departed friend. Cassady, like Hunter Thompson was truly a legend in his own time – and like Hunter Thompson I long wondered whether the persona was genuine or if he was pandering to his public. In the case of HST I came to the conclusion that strange as he was his weirdness was genuine if heavily influenced by the approval he received for his antics from his fans and friends. Cassady appears to be similarly genuine and impelled by a high revving engine to always be moving, doing, rapping and ahem, screwing. His life took the course of a spinning top bouncing off everyone and thing it ran into from his desolate childhood in the slums of Denver to NYC where he encounters Kerouac and Ginsburg at Columbia to SF Bay area and finally to San Miguel de Allende, Mexico where he died a not altogether surprising death at the age of 42. Of all the women that flowed thru his life none are more prominent if not quite as interesting as Carolyn Cassady. She stayed in his life, raising his children as Neal hooked up with and in several cases married other women essentially committing bigamy for what it’s worth. Women were everything and nothing to Neal; his looks and rap were relentless after the other having their predictable effect on one right up until the end. One of the sad but interesting themes that runs through this bio is Neal’s fascination with writers and desire to write notwithstanding the fact that he was only semi-educated. That he was living with an alcoholic father in a slum-like boarding house in Denver’s run down Larimer district it’s surprising that he went to school at all much less that he developed an interest in books. His life was further disrupted with trips to juvenile detention and much later a few years in prison for drug possession (an infraction that wouldn’t even be acknowledged today). Nonetheless, for much of his adult life he attempted to write, although the only output is the autobiographical “The First Third” which was not published until three years following his death in 1968. Ah child of countless trees, ah child of boundless seas. What are you, what are you meant to be? I can tell by the way you smile he is rolling back. Come wash the nighttime clean, come grow the scorched ground green. Blow the horn, tap the tambourine. Close the gap on the dark years in between. *Check out Bob Weir’s solo album Ace from 1972 in which “Cassidy” is the last song on what is all-time great album. Great biography on one of the 'heros' of the Beat Generation. He was Kerouac's muse and alter-ego but what is great about this book is that the authors, after conducting extensive research and interviews over a period of about 10 years, were able to debunk some of the myths around this man who occupies a legendary postion in beat folklore. 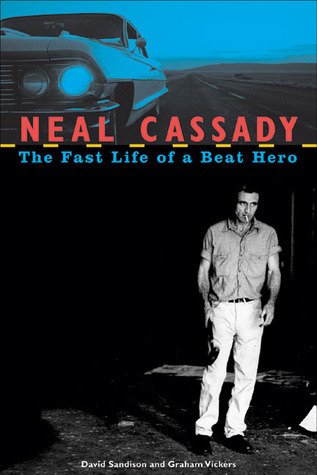 Known as 'Cody' in some of Kerouac's novels and 'Sir Speed Limit' as the driver of Ken Kesey's bus of merry pranksters, there is another side of Cassady which Great biography on one of the 'heros' of the Beat Generation. He was Kerouac's muse and alter-ego but what is great about this book is that the authors, after conducting extensive research and interviews over a period of about 10 years, were able to debunk some of the myths around this man who occupies a legendary postion in beat folklore. Known as 'Cody' in some of Kerouac's novels and 'Sir Speed Limit' as the driver of Ken Kesey's bus of merry pranksters, there is another side of Cassady which this book reveals. Like Kerouac, he was a very troubled young man who had a depressing upbringing in which his alcoholic dad tried to raise him in the slums of Denver, a man who tried to commit suicide at various times throughout his life and who was incredibly restless and full of energy (apparently masturbating up to 5-6 times on any given day!). The way he treated people close to him like his wife Carolyn and the way he conned other people or stole from them would seem to indicate a man who is just simply selfish and a USER. However, what is fascinating about this man whose energy was so infectious that he inspired a whole new movement which changed America was that he also had a sweet and compassionate side. As other reviewers have pointed out, probably his most redeeming feature is how he adored his children to Carolyn and, when he was around, was actually a good father to them. There are a few movies either directly or indirectly about Cassady. I have seen 'The Last Time I Committed Suicide' and although Keanu Reeves' performance (supporting role) is pretty cringeworthy as usual, the main actor who plays Cassady puts in a good performance. This movie is based around the famous Joan Anderson letter of which only a fragment remains today. As the authors of this book point out, this letter became very famous as it inspired Kerouac to the point where he decided to change his style of writing from long Wolfean sentences ('The Town and the City') to something more resembling immediate speech which Cassady had down pat at times in his letters. That is to say, Cassady tried to approximate his writing as closely to actual speech - both his own speech and his dialogue with others - and Kerouac saw how powerful the immediacy of his language was. This is perhaps the greatest legacy that Cassady left behind. I even wonder how aware he was of his impact on others and his generation. Therefore, the 'voice' that you hear in Kerouac's 'On the Road' is actually CASSADY'S voice but paraphrased through Kerouac's chronicling of what he remembers of their adventures together. Therefore, this book highlights the huge debt of inspiration that Kerouac owes to Cassady. The authors also point out the large number of 'untruths' in Neal's autobiography fragment, 'The First Third'. Many of the details in that book regarding his family and ancestors have now turned out to be untrue but it appears that Neal Cassady Sr. (his dad) may have been largely to blame for this as a lot of what Neal Jr. wrote was based on what his dad told him growing up. However, Neal Jr. was notorious for embellishing stories or for outright lying in order to feed into the growing myth over his legendary status so it's hard to know how much of his autobiography is based on what his father told him and how much comes down to self-mythologizing. Caroline Cassady has a great book out called 'Off the Road' which everyone raves about and which I would like to read sometime this year. I think she probably offers another important angle on this great story. In the movie 'What happened to Kerouac? ', Caroyln says that Jack's portrayal of Neal in 'On the Road' only shows one side of who he really was. But, that was the side of Neal that everyone who bought Kerouac's best-selling novel believed him to be (that is those people who didn't mistake Jack for Dean Moriarty!) and according to Jack's first wife Edie Parker, Neal was kind of 'forced' into becoming this romanticized legendary version of himself due to the influence of Kerouac's work. And this may have been one of the things that accelerated his demise. After the publication of 'On the Road' which had a phenomenal effect on the whole nation, Neal proceeded to perform like a practised 'circus seal' (can't remember Carolyn's exact quote) by trying to perform amazing feats including juggling a type of jackhammer (Williams Lok-Hed sledge hammer to be precise) to the amazement of his adoring fans. Finally, this book also explores the deep effect of Edgar Cayce's philosophy on Neal and Carolyn, something which I knew nothing about before reading this book and something which tells you about the popularity of altnerative philosophies and schools of thoughts in the US during teh 50s and 60s. Although Neal was far from being a saint, in fact he was quite a horrible person to family and friends at times, there is something very attractive about the positive aspects of Neal's personality and it was these aspects that Kerouac identified and celebrated in his novels: his love for and embrace of life in the most exuberant manner possible, his unrelenting individualism, his dedication to become the best at everything (both in sports and academically, including memorizing sequences of numbers) and most importantly his adoration of his children. Some people like Kerouac and Cassady are headed for a tragic end the day they are born but the amount of living they do in that small amount of time they are here on earth with us is truly amazing. In the contemporary world where people who have a job are largely overworked and miserable, there is much we can learn about the joy and exuberance of the beats. Many people think that 'beat' just refers to people being 'tired' or 'world-weary' but it was much much more than that. It also meant 'sympathetic' (see Kerouac's reading of excerpts from 'On the Road' and 'visions of Cody' on the Steve Allen show). There is also a nice short interview with Kerouac from the late 50s or early 60s in French. When the French interviewer asks him what the word 'beat' means, Kerouac talks about negros sleeping in subways who are obviously 'beat' in the sense of tired but then Kerouac looks straight at the camera, winks, and says 'but (they are also) full of joy/glee (in French he says 'joyeux')'. Beautiful. In summary, a great biography on a truly disturbing but remarkable man. Highly recommended for fans of beat literature. Some years ago I read another biography of Neal Cassady, The holy goof by William Plummer. The only book that Neal Cassady himself had published was a partial autobiography, The first third, so this is not a literary biography in the sense that Cassady was a famous author. His claim to (literary) fame was that he appears as a character in the novels of his friend Jack Kerouac and the poems of his friend Allen Ginsberg, and also in Go by John Clellon Holmes. Kerouac and Ginsberg admired him tremen Some years ago I read another biography of Neal Cassady, The holy goof by William Plummer. The only book that Neal Cassady himself had published was a partial autobiography, The first third, so this is not a literary biography in the sense that Cassady was a famous author. His claim to (literary) fame was that he appears as a character in the novels of his friend Jack Kerouac and the poems of his friend Allen Ginsberg, and also in Go by John Clellon Holmes. Kerouac and Ginsberg admired him tremendously, and he influenced their writing in several ways. He was the protagonist of Kerouac's On the road, thus providing the subject matter, but he also influenced Kerouac in his style of writing. I was pulling books for interlibrary loan the other day and was downstairs in the history section when I came across this book. I don't know much about the beat poets and knew even less about Neal Cassady, so I grabbed this book for myself. Cassidy my parnter is named after Neal Cassady, via a Grateful Dead song titled simply, "Cassidy," so that had me interested too. Turns out that Neal Cassady lied to, manipulated, coerced, and cheated just about everyone he ever knew. From most accounts, he wa I was pulling books for interlibrary loan the other day and was downstairs in the history section when I came across this book. I don't know much about the beat poets and knew even less about Neal Cassady, so I grabbed this book for myself. Cassidy my parnter is named after Neal Cassady, via a Grateful Dead song titled simply, "Cassidy," so that had me interested too. Turns out that Neal Cassady lied to, manipulated, coerced, and cheated just about everyone he ever knew. From most accounts, he was not a sensitive or caring lover. He had multiple wives and girlfriends at the same time, while letting each think she was the only one. The one redeeming quality that I can identify after reading this book is that he really loved and cared for the kids he had with Carolyn Cassady (at least the first two). Neal Cassady ran his body into the ground with drugs and fast living, dying when he was in his early 40's. That means he never had a chance to redeem himself in my eyes the way William Burrouhgs, Sr. and Charles Bukowski were able to do as old men. I saw this biography in Mac's Backs and knew I had to have it. I knew him only as the basis for character you couldn't take your eyes off of in Kerouac's "On the Road" and wanted to know what his story was. Neal Cassady was jerk, but a charismatic and influential jerk. In that respect, not unlike most politicians. But he grew up on the other side of the tracks, became a petty criminal, dope fiend, womanizer, and icon of the Beats and the Hippies. Jack Kerouac immortalized him as Dean Moriarty in I saw this biography in Mac's Backs and knew I had to have it. I knew him only as the basis for character you couldn't take your eyes off of in Kerouac's "On the Road" and wanted to know what his story was. Neal Cassady was jerk, but a charismatic and influential jerk. In that respect, not unlike most politicians. But he grew up on the other side of the tracks, became a petty criminal, dope fiend, womanizer, and icon of the Beats and the Hippies. Jack Kerouac immortalized him as Dean Moriarty in "On the Road"; Allen Ginsberg fell in love with him, mentioning him by his initials in Howl; besides them he hung out with William Burroughs and Lawrence Ferlinghetti; and he drove Merry Pranksters' psychedelic bus Furthur for Ken Kesey on their epic journey across America. An idyllic hero in the Ayn Rand mold. Any reader familiar with the biographies of the various beat writers will find little new information in this book as much of the detail of Cassadys life has been covered in these. It is good however to read a biography dedicated to the man himself given that he was such a major inspiration for a literary genre. A comprehensive portrait of a Beat Generation Legend that attempts to demythologize the cornucopia of myths swirling around Neal Cassady. However, his life makes such an interesting read that it remains mythological. Neal Cassady lead the life that I wish I could have if I only had the balls to live it. OK, the guy invented the hipster and then, helped kick start the hippie movement in the 60's...facinating character this one.